There was much excitement at our house on Tuesday morning; we had got our first two blobs of frog spawn in the pond, we now have at least eight blobs. The frogs started to appear in the pond on Saturday 8th February and have been croaking on damp, mild days and especially nights ever since, I did a rough head count today from the window with my binoculars and counted 22 but I am sure that there are more under the water too. 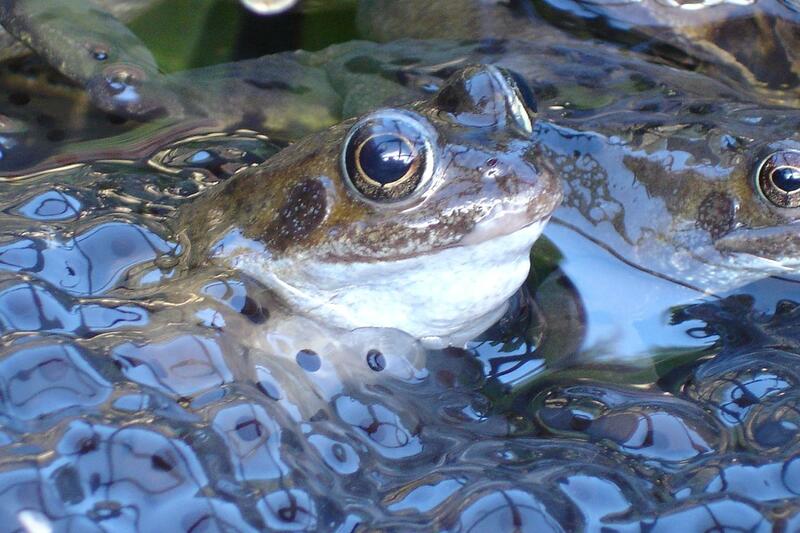 Last year the frogs appeared on 16th February but didn’t lay any spawn until 9th March but we had that long spell of cold, frosty weather making spring late, in 2013 the first blob appeared on 28th February. Frogs spend much of their adult lives on land but return to water (usually the same pond) in spring to mate and lay their spawn, each blob of spawn can contain 1,000-2,000 eggs this may seem a lot but only a small percentage will survive the journey to adulthood, frogspawn can freeze or dry out and many tadpoles and young frogs are eaten by predators. Frogs lay their spawn in a single clump near the water’s edge often in the sunniest and warmest part of the pond; fresh frog spawn is firm and solid and will sink to the bottom, where it will absorb water and then float. Each single ball is made up of two distinct parts, in the centre is the dark ovum (egg), this will develop and grow into a tadpole, surrounding the ovum is a sphere of clear jelly, this jelly provides nourishment for the developing tadpole before it hatches as well as insulation from frosts and protection from diseases, predators and the sun. 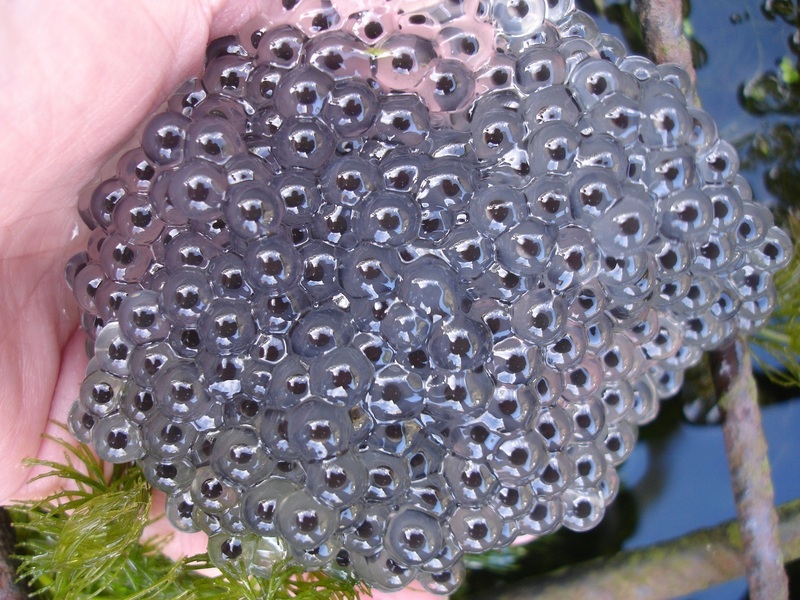 If you handle frog spawn you will notice that the top of the ovum is black/dark brown and the underside is pale grey, this pale underside is the developing tadpole’s yolk reserve, always return the spawn to the water the right way up. Frogs can lay their eggs in the most inhospitable places – damp ditches, tractor ruts, temporary ponds in flooded fields and even puddles all of which can dry up very quickly. If you come across some wild stranded frog spawn or tadpoles rescue them and find them a new home in a nearby wild pond, to prevent the risk of spreading diseases it is not advisable to put them into a garden pond or likewise transfer garden frog spawn/tadpoles/frogs into wild ponds. Both myself, Kim and Sylvia have ponds in our gardens all of which are home to many frogs, this year I am the first to have frog spawn – not that I am competitive! Why not have a look for some frog spawn this weekend and take some photographs of it, make a note on your calendar or in a Wildlife Diary when you see your first frog spawn of the year.